The Menino administration has agreed to provide $7.8 million in tax breaks to help developers of a $950 million complex at TD Garden lure aStar Market and build underground parking spaces. Mayor Thomas M. Menino has just 18 days left in office, but it turns out that is plenty of time to add a few towering peaks to Boston’s skyline. The Boston Redevelopment Authority on Thursday approved several massive development projects, including a hotel and condominium high-rise in the Back Bay, a dormitory for Emerson College, and a large complex of buildings that will dramatically alter the face of the TD Garden. The $950 million complex at the Garden will consist of three towers, the tallest reaching 600 feet or about 60 stories. The buildings will contain a 306-room hotel, 668,000 square feet of offices, nearly 500 residences, and stores and restaurants. A new Star Market will be built underground, along with 800 parking spaces. The Menino administration has agreed to provide $7.8 million in tax breaks to help the developers lure the Star Market and build the underground parking spaces. The tax agreement will spread the relief over 15 years. During that same period, the development is expected to produce $32.2 million in new tax revenue for the city. Dozens of people appeared at the hearing to speak in favor of the project. Several residents also spoke in opposition, raising concerns that the complex is too tall and will create traffic problems on busy Causeway Street. Some also questioned the need for a tax break to help with the project. Representatives of developers Boston Properties Inc. and Delaware North Cos. said the tax agreement was crucial to attracting a supermarket to the property and asserted the project will help enliven the area around the arena. The project will be built in stages, with the first phase to include a multistory retail base, the supermarket, a cinema, a hotel, and parking. Construction is expected to start within the next 18 months. Thursday’s meeting was among the last BRA sessions of Menino’s 20-year tenure, which is ending with the approval of several projects that promise to transform vast swaths of the city. In recent months, the BRA has faced criticism for increasing the frequency of meetings to take up a flurry of building proposals in the waning days of Menino’s tenure. It has approved towering redevelopments of the Government Center Garage and the Christian Science Plaza, as well as residential towers in the South Boston Innovation District, the West End, Fenway, and elsewhere. BRA director Peter Meade responded to those concerns at the start of Thursday’s meeting, saying that more than 300 community meetings have been held over the last year to discuss projects that have come before the authority. A final BRA meeting under Menino is planned for Jan. 2, just four days before Mayor-elect Martin J. Walsh takes office. 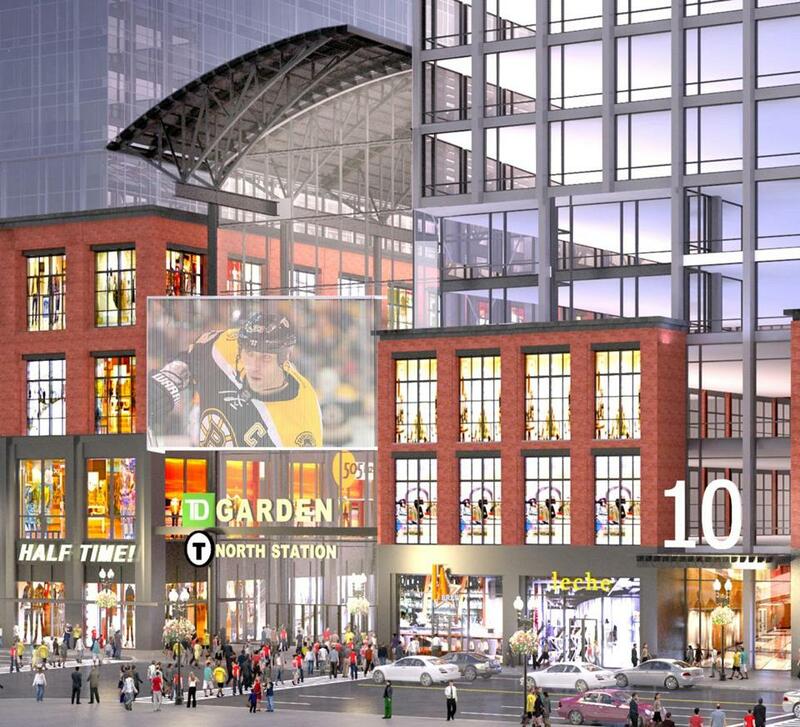 In addition to the TD Garden project, the BRA board on Thursday approved an 18-story dormitory for Emerson College overlooking Boston Common, and a 33-story hotel and condominium building at 40 Trinity Place in the Back Bay, among other projects. The building at 40 Trinity, situated next to the John Hancock Tower, will include a 227-room hotel, 115 condominiums and several restaurants, including one on the 18th floor with an outdoor terrace overlooking the South End. While many have expressed enthusiasm for the project, it has generated opposition from neighbors who have raised concerns that it would worsen traffic and high winds. The developers have promised to add trees and shrubs they say will lessen the force of wind gusts that blow through the area. They pledged that the project will bring 24-hour life to a dark corner of the Back Bay.